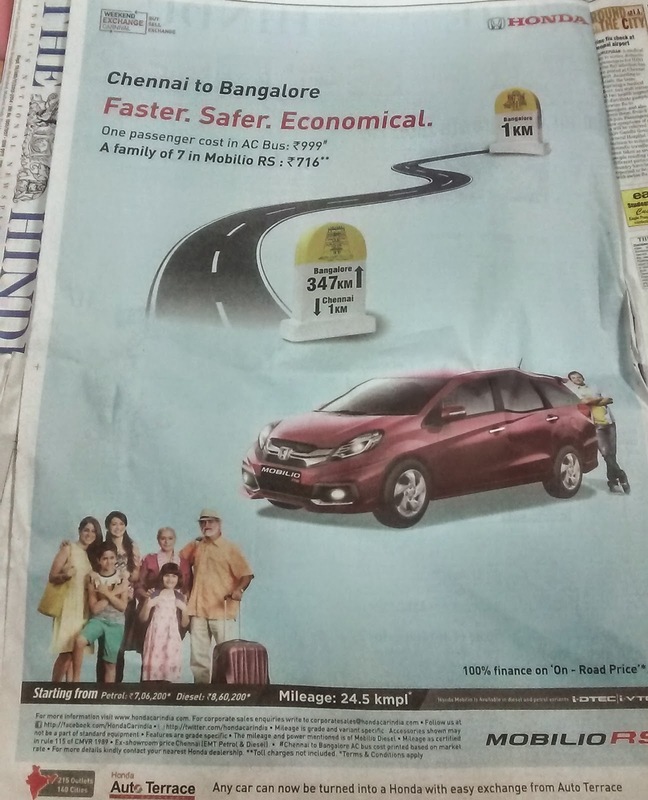 Home / Analysis and Strategy / Automobiles / Business and Marketing / product or service reviews / What happened when I complained to Advertising Standards Council India about Honda Mobilio Ad? What happened when I complained to Advertising Standards Council India about Honda Mobilio Ad? S Senthil Kumar wrote a comment suggesting that I complain to Advertising Standards Council Of India (ASCI) in this regard. I thought why NOT and on their website (ascionline.org), registered a complaint. In my complaint was that it is not possible to reach Bengaluru from Chennai with Rs 716 and bus tickets are much cheaper than what's specified in the ad. This was on 12th Feb.
Feb 12: After I file the complaint on ASCI website, I get an automated acknowledgment. Feb 18: I get a mail stating my complaint has been received. March 10, 2015: I receive an email that my complaint has been processed and a copy of my complaint has been sent to the advertiser for an explanation. April 8, 2015: I receive an email that my complaint has not been upheld in their review meeting. Below is the exact text of the response I got from ASCI. As per their decision, the complaint has NOT BEEN UPHELD. The CCC viewed the print advertisement and considered the Advertiser’s response. The CCC concluded that the claim, “One passenger cost in AC Bus: R.999, A family of 7 in Mobilio Rs.716”, is not misleading. While I am happy to know that there seemed to be some process to accept complaints and evaluate them, what is surprising is the way complaint is dismissed without adequate due diligence or explanation. For example, I do not know what is Honda's response to this. Or how they justified the numbers used in the advertisement or on what rationale/basis ASCI decided that my complaint is incorrect?. I could have been given a copy of their response and given an opportunity to present my view on the response. There was no such thing. Above mail doesn't have a single word about the ad other than what I had originally provided in the complaint. Disclaimer: I’ve nothing against Honda cars. Just that when I saw their above ad I felt uncomfortable as numbers were far from true. Then a reader commented about the complaint mechanism that exists, I decided to give it a try. I got SMS and email at regular intervals about my complaint, so the system they have seems fine. But the way complaint is closed, without offering any explanation or answers implies they are not taking enough effort to do a thorough investigation of facts and figures before closing a complaint. Update: I also sent a mail to ASCI asking for a copy of Honda's response. No reply yet. Update: May 17th. More than a month and I haven't got a reply from ASCI, despite an intervention from Sucheta Dalal. What do the two stars next to the amount indicating? I mean what is the fine print? Why should it not be included? Shrinidhi. You will have to fight every single ad in the world at this rate. Atleast give some credit to the consumers - we are a little more smart than believing blind numbers on an ad. very misleading isnt it? Well thats just one example. I am just saying that your complaint isn't justified. All mileages are in the best conditions only. Also i doubt ANYBODY is going to buy this car based on this ad. Of course they know the initial cost involved in buying the car. Also toll charges are subject to change - so them mentioning clearly that it is not included is actually a decent thing to do. Plus the toll is per car/vehicle not per person. Probably spending too much time on this post but funnily enough I actually have something to say. Owning a car in India is still a matter of comfort/luxury and not a necessity yet. 1) If I have to make a trip on an emergency I dont have to be dependent on bus timings, availability etc. Taking a car would still mean cheaper than a flight/train for short trips. 2) I can make the trip any time of the day. 3) I can take multiple breaks where ever I want - especially when I have elders travelling who need the break to stretch their legs. 4) I can take multiple trips as many times as I want regardless of availability of tickets. On your first comment, yes, consumers are smart- no one will buy this car because of this ad. I wasn't intending to fight every ad.. Having traveled between the 2 cities in all modes of transportation, I wanted to highlight that numbers are exaggerated. W.r.t ASCI, I wasn't expecting any miracles from them, but wanted to know their process and how seriously they pursue a complaint. On second comment, even diesel prices change. They could have factored current toll charges as known. On the third comment, very valid points. Having a car has its advantages for sure. That is why I usually rent a car, wherein I get most of these advantages, and not necessarily buy a car. @enidhi-This process is a total hogwash -what has happened in this case.You should be allowed to represent your case .Even if they dont give your all details of honda's response -you should be allowed to hear them when they represent themselves. There is no process here ,you are just assuming there is one. @The Wild: That is a good possibility. May be we should file a dummy complaint with text "enidhi is a very good fellow" and after 2 months, we might get a mail "Your complaint- enidhi is a very good fellow- is not withheld" without adding any other word or indicating that complaint is not making any sense. Hi. I have sent your feedback to ASCI. All i can say is that there is a proper process followed. And I am sure there was a justification -- it would not have been rejected otherwise. The committee may want to think through the communication. But I can vouch for the fact that the process is transparent. The point is about the policy about the detail in which it is conveyed to the complainant. I am sure you will hear from ASCI on this. ASCI is run by members of the advertising industry - i.e. the same people who wrote the ad, those who are paying for its display and those who display it. Further it is a self-regulatory body, not a Govt. entity. They are more effective in comparative advertising; say, if Mobilio says it is better than Ertiga using similar assumptions (like inflating the running cost of Ertiga by 40% and using test conditions figures for Mobilio), then there would be a whole lot of action. When consumers complain, they just want to make a show of the process. If we are serious about such misleading advertisements we need to approach consumer courts, or make fun of such ads on social media (suggestion of Mobilionomics: Mobilio is 3 times faster than flights*****. **** top speed of Mobilio is 180 kmph, Chennai-Bengaluru distance is 360 km, so we reach in 2 hours; flight takes 6 hours - 1 hour to Meenambakam, 1.5 hour wait; 1 hour flight; 30 minute baggage retrieval; 2 hours from Airport to Sarjapur Road).